gardening in the boroughs of nyc: I love growing mint! I bought a spearmint plant from a garden center a few months back, and it's been doing great. Every week, I've been picking the leaves off the plant and making mint iced tea. I add a little bit of honey to sweeten it up. Oh, it is sooo good. So many people have told me not to plant the spearmint into the ground because it grows like crazy. I'm thinking though that I wouldn't mind if I had plants multiplying out of control since there are so many recipes I can try with this yummy mint! I was wondering if anyone would tell you that! Fresh mint SO rocks in teas! Careful what you ask for! I'm still trying to rid my garden of the herb. Don't forget about Mojitos. Mmmmmmm. I agree with Thomas. I have all of my mints in pots. There was a very small amount of mint in the ground when I moved here 5 years ago. It took me 3 years to get rid of it. It will completely take over! I agree. I love mint....in watermelon & feta salads, in lemonade, in water, in tea.....the possibilities are endless. I agree with everyone! LOL LOVE mint and while mine is in the ground it is way to controlled so I am moving it soon. 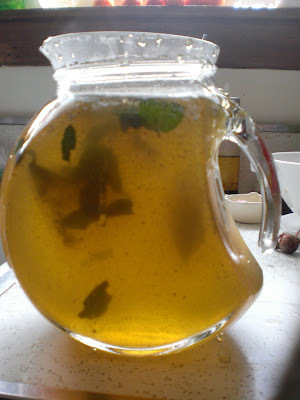 I want lots and lots of mint, I put it in almost every summer drink. Water, tea and mojitos (non-alcohol is refreshing). It can get invasive, but when the lawnmower runs over it - the smell is wonderful. I love mint, too. Every time I make a glass of tea I run outside to snip off a few leaves. It was always my job when I lived with my parents to cull the mint patch so that it wouldn't take over the yard. I planted a few pathetic mint stalks at my house, and in no time, they started producing like mad. It's quite a resilient plant!